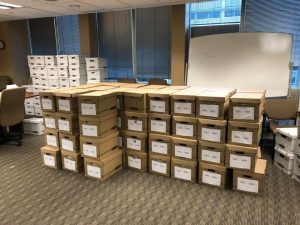 Colorado Rising petitions — 200 per box. Must have been much ado about nothing over at Colorado Rising headquarters, where activists raised many a ruckus over stolen petitions and missing information on signatures gathered — a nefarious plot, they claimed, against their efforts. Turns out they had more than 170,000 signatures, which they turned in this week to the Secretary of State’s office in the hopes of getting their setback measure on the ballot to block energy development. A third attempt in 2014 resulted in a brokered compromise between Democratic Rep. Jared Polis and Democratic Gov. John Hickenlooper. Democrats should remember that when going to the polls to cast ballots for governor in November. On the other side of the battle is the Colorado Farm Bureau, which turned in a whopping 209,000 signatures to protect those whose mineral rights or property would be devalued by the proposition being pushed by environmentalists. Ultimately, former Colorado Oil and Gas Conservation Commission head Dave Neslin said lawsuits seeking billions of dollars in damages could be in play. Stay tuned to see what other petitions were turned in this week.